Mililani Mauka Veterinary Clinic is proud to serve the Mililani HI area for everything pet related. Our veterinary clinic and animal hospital is run by Dr. Jamie Furutani, who is a licensed, experienced Mililani veterinarian. Our team is committed to educating our clients in how to keep your pets healthy year round, with good nutrition and exercise. 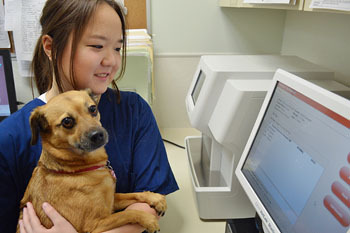 Mililani Mauka Veterinary Clinic stays on top of the latest advances in veterinarian technology and above all, remembers that all animals and pets need to be treated with loving care in every check-up, procedure, or surgery. Before entering veterinary school, Dr. Asay worked at Tufts University as an internal medicine and ECC (emergency critical care) Technician. She had a special interest in working with large animals, but after graduating from Ross University in 2015 and moving to Hawai’i, her focus changed. She first came to Mililani Mauka Veterinary Clinic to receive acupuncture treatment for her dog. Soon after she was hired by Dr. Furutani as a relief veterinarian, which became a full time position. Two years later, Dr. Asay along with her fishies and 2 cats, are happy to call MMVC apart of her family. Originally from Mililani and former valedictorian of Pearl City High School, Dr. Cenal graduated from Colorado State University College of Veterinary Medicine in 2002. Upon completion, he practiced veterinary medicine in Florida, Virginia, and Oregon before returning to our community with over a decade of experience. When not collecting comic books, enjoying national parks, or making furniture, he can be seen walking with his chocolate Labrador, Charlie. Dr. Shah graduated from Colorado State University College of Veterinary Medicine and Biomedical Sciences; she received her Master’s in Science from the University of Hawai’i, and her certification for Medical Acupuncture for Veterinarians in 2009. With her husband Robin and baby Kealia they enjoy surfing, playing Capoeira traveling, and hanging out with their adopted dogs, Lilia and Luna, and adopted cats, Gobi and Shrimpy. 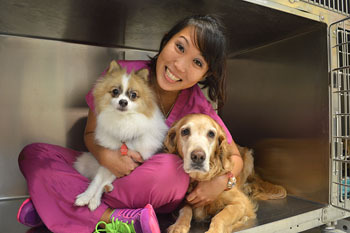 Owner and founder of the Mililani Mauka Veterinary Clinic, Dr. Furutani has been practicing veterinary medicine since she graduated from the College of Veterinary Medicine at Oregon State University in 1997. With an interest in canine rehabilitation, she is now one of the few certified rehabilitation therapists on Oahu! Her three dogs (Mack, AJ, and Trooper) are seen daily at the clinic. Elizabeth earned her BA in Biology from the University of Hawaii. She joined the clinic staff in 2013. Elizabeth has 3 kittens, Coco-Bar, Leo, and Jason Bourne. Born and raised in Mililani, Jenn has loved animals her whole life. On her free time she enjoys the beach, yoga and taking care of her three kitties, Rizzo, Chloe, and Mila, and her three dogs Tofu, Hokulei, and Enzo. Jayme joined the clinic staff in 2012 as a Certified Veterinary Technician. She works with Animal Rehabilitation patients who have various injuries and diseases that require treatments such as rehabilitative exercises, therapeutic modalities, and acupuncture. She has a Bichon Frise named Yoshi. 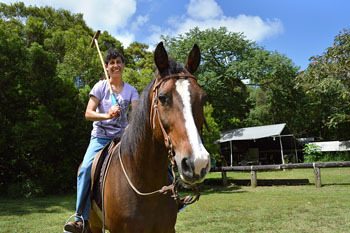 Kally has worked as a veterinary assistant for over 20 years, beginning her work at Mililani Mauka Veterinary Clinic in 2008. She has a dog named Miracle and is fostering a dog named DeeDee. Kally also owns one cat named Zippity. On the weekends, Kally enjoys playing Polo with her horse, Kolohe.